Enough chit-chat. Just make this crust because I know you will LOVE it. Even if you aren’t vegan…you’ll STILL love it!!! Best crust I have EVER made at home, hands down, vegan or otherwise!!! Soyrizo, red onion, spinach, tomato, black olives, crimini mushrooms. When almost finished baking brush crust with melted vegan butter & garlic powder. In a large bowl, dissolve sugar in warm water. Sprinkle yeast over the top & let stand for about 10 minutes, until foamy. Stir olive oil & salt into the yeast mixture, then mix in the whole wheat flour and 1 cup of the all-purpose flour until dough starts to come together. Tip dough out onto a surface floured with the remaining all-purpose flour & knead until all the flour has been absorbed & the ball of dough has become smooth (about 10 minutes). Place dough in a lightly-oiled(I use my Misto) bowl & lightly oil the top of the dough. Cover loosely with a towel & let stand in a warm place until doubled in size. Usually, this takes about 1 hour. When the dough is doubled, tip dough out onto a lightly floured surface and form into a tight ball (could divide into 2 smaller balls for smaller pizzas). Let rise (either on surface or back in bowl) for about 45 minutes, or until doubled. Preheat oven to 425°F. Roll dough with rolling pin until about 1/2-3/4 inch thick then drape over both of your fists & gently pull the edges outward while rotating the crust. 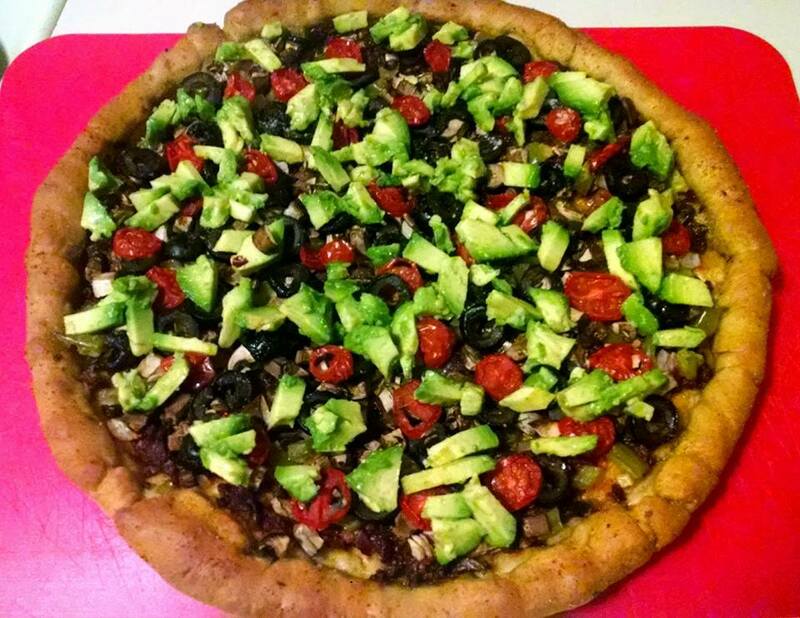 When the circle has reached the desired size, place on a well oiled pizza pan. Add toppings. 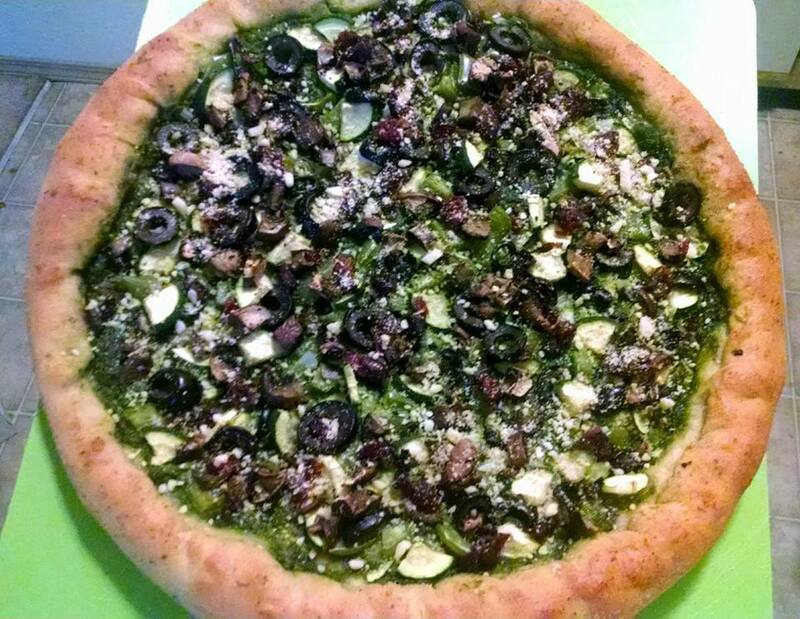 Pesto (homemade or otherwise), crimini mushrooms, black olives, zucchini, red onion, green bell pepper, dried cranberries. After baking top with Vegan Parm and/or plain nutritional yeast! Bake for 12 minutes then pull out and brush crust with vegan butter & sprinkle with garlic powder. This is why the crust is SO amazing!!!! Bake for an additional 5-10 minutes (depending on thickness and crispiness desired) until the crust is crisp and golden to your liking. Posted on May 22, 2014 by OregonKitchenPosted in VeganTagged dairy-free, dairy-free cheese, fast dinner, fresh, fresh meals, healthy, healthy cooking, healthy dinner, healthy meals, vegan, vegan baking, vegan bread, vegan cheese, vegan cooking, vegan dinner, vegan lunch, vegan pizza, vegan pizza crust, vegan pizza dough, vegan yeast bread.